Things are moving along. Literally. We are loading up about half of our wordly possessions into a truck this afternoon. And then, of course, we will need to get them to another state. And unload them. So there is that. But we have friends to look after the cat, and need to take Mariam to visit a school in Massachusetts on Thursday anyway, so it just made good sense to load up people and puppy and move a few things now. The rest of the move, which I suspect will be the larger undertaking, will be in a couple of weeks. But before that happens, we have to do important things like watching this guy I live with graduate from medical school and what not. One of the fun things about moving (there are some fun things, right?) is all of the forgotten treasures that you dig up while sorting through stuff and throwing things into boxes. My hands-down favorite in this department at the moment are a set of invoices and cancelled checks that my dad saved from my adoption. Apparently, it cost about 1,200 dollars to secure the necessary paperwork for the permanent parenting of yours truly. On some level, I find this so hilarious that I struggle to even put it into words. Like, "such a bargain!" Oh, man. I wonder if my mom still thinks that? Ha! I also think it is fantastic that my dad saved the actual, physical cancelled checks that he wrote to the adoption agency. Such a strange and relatively awesome family artifact to find myself in posession of. And, with him being an accountant and all, it is also a perfectly appropriate example of his brand of sentimentality. Which really, is also my kind of sentimentality, I suppose. I don't go much for the really mushy stuff. But, show me a quirky, weird, or otherwise unexpected little nostalgic tidbit you've stashed somewhere, and I am all yours. Wednesday will be the last day for the big Alphabet Glue May moving sale! Any and all issues of Alphabet Glue are on sale through Wednesday night. Enter "may25" at checkout for 25% off. There are lots and lots of great book recommendations, printable pages and fun science and craft projects in there; perfect for getting busy with the small folk this summer! Treasure Maps and Procedural Concerns. Well. I had thought that today I might write a tidy little post about springtime living and dandelions blooming and all of that nice business. But really, I'm sitting in a room half-filled with boxes (which are also half-filled) and am trying to sort out other procedural items like how to get to the post office while my car is in the shop and whether or not I should be repainting furniture or sorting through the terrifying tornado of Mariam's bedroom closet. I think that at the moment, I'm going with neither one. But I did want to mention that I have a new post up today on the Sparkle Stories blog. It is a little tutorial on making paper look weathered and worn for purposes of DIY treasure map making. Pretty fun, actually. Mariam is very picky about how she spends her time around the house these afternoons. The weather has been beautiful and if she is going to do anything inside the house, it had better be good. She gave this project a big thumbs up (and drew a map to her favorite salamander nest in the woods near school), so I think you'll like it too. You can find it here. On Friday Morning: Some Sparkle (and a Sale). Oh, Friday! I am happy to see you. Before I get distracted by rambling about boxes and packing tape and what to do with rainboots that don't fit anymore, I should mention that I have a fun post up on the Sparkle Stories blog this week. 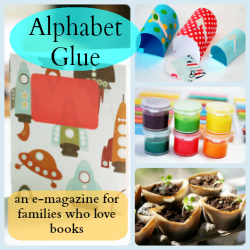 It is a really easy project created with Mother's Day in mind, and I think that if you are fans of Alphabet Glue at all, you will really like it. You can find it here. It is also the first in a series of weekly posts that I will be doing to accompany various Sparkle Stories, and I'll be sure to keep you all posted when the next project is up and ready to go. I'm so happy to be joining David and Lisabeth in their wonderful work over there! In other news, we have obviously known for days and weeks and even months that our big move would be coming in no time at all. But, I still feel like it has snuck up on me just a bit. I don't know if it is because the weather has warmed and we would all rather be outside playing in the grass, throwing the frisbee, and blowing bubbles than packing, but somethng has shifted in the last few days and I think that we are all feeling like our time here in Vermont is running pretty short. Indeed, there is now talk of taking a first load of stuff down to the new house in Massachusetts as early as the middle of this month. Which, if my calendar is to be believed, is not very many days away from now. Ack! This is all to say that it is very much time to start hauling boxes up from the basement and filling them with books and muffin tins and the quilts off the couch. And the sorting through of small people clothes that may no longer fit is probably also going to need to happen. Mariam is wildly uncooperative in this department, so that ought to be good fun. The girl is not a fan of getting rid of anything that has potential to be useful; this much is true. I guess the upside of this personality quirk is that she can also construct pretty much anything out of cardboard if given enough tape. I have decided that having an Alphabet Glue sale is probably an excellent way to create a false sense of downsizing for the big move. Granted, the magazine files are digital, so I'm not really getting rid of anything at all. But I will feel like I am, and that will be awesome. So I think we should go for it. And, I think we should make it kind of a big sale. So, 25% off all issues of Glue through May 15th by entering "may25" at checkout.